ust as culturally there is so much to be discovered just beyond the bounds of Tuscany so it is when it comes to viticulturally derived masterpieces. This is not a section of also-rans but includes exciting top-quality producers increasingly bringing the best out of a rich heritage of native varieties. 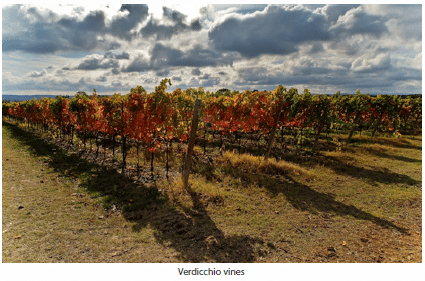 Of the growing number of fine reds, the trio of Sangiovese, Sagrantino and Montepulciano offer the greatest riches, but also to be unearthed are compelling Cabernet Sauvignon/Merlot blends and stylish whites from Verdicchio and, lately, Pecorino. Emilia is of course much celebrated for its gastronomic riches. It doesn’t share that world-wide reputation for its wines but in (real) Lambrusco with four DOC zones of its own, it does have an excellent food wine. Top examples from Cleto Chiarli (Chiarli 1860) or Ermete Medici are a good bet. Emilia’s two most significant other DOCs are for wines from the low hills to the south of the cities of Piacenza and Bologna. Both the Colli Piacentini (contiguous with Lombardy’s Oltrepò Pavese) and Colli Bolognesi (now DOCG) can produce decent Cabernet Sauvignon and Barbera as well as Chardonnay, Sauvignon and Malvasia. Gutturnio is a speciality of the former, a blend of Barbera and Bonarda of good character and quality from a handful of producers. If in Bologna, seek out Giuseppe Beghelli, Floriano Cinti, Isola, Terre Rosse or Vallona. Alternatively if stopping over in Piacenza consider La Stoppa, La Tosa or Luretta. More exciting in viticulture terms is Romagna, where the best Sangioveses outside Tuscany are now produced. Though much Sangiovese di Romagna is pretty basic, the best examples have depth, intensity and excellent texture and concentration where there is denser planting and lower yields. Several of the best producers (including Calonga, Drei Donà, San Patrignano, San Valentino, Tre Monti and Zerbina) combine their efforts through an association, Convito di Romagna in an attempt to better promote Romagna and Sangiovese. Most also make good wines from Chardonnay, Cabernet Sauvignon and other imports. Both a slightly nutty, dry and a sweet version of Albana di Romagna (DOCG) are made; the latter, as passito, made from dried grapes, is usually far superior (Zerbina’s is exemplary). This region is still best-known for Verdicchio dei Castelli di Jesi but top examples are light years ahead of the cheap and cheerful examples poured from amphora-shaped bottles 20-odd years ago. Both the wines from the Castelli zone and the more inland Verdicchio di Matelica will now display finesse and complexity allied to good concentration and structure if bought from a top producer. The best from Castelli di Jesi include those from Bucci, Coroncino, Garofoli (Podium, Serra Fiorese), Marchetti (Cavaliere), Montecappone (Utopia), Marotti Campi (Salmariano), Monte Schiavo (Pallio di San Fiorese, Le Giuncare), San Lorenzo, Santa Barbara, Sartarelli, Tavignano (Misco), Umani Ronchi, Velenosi, Vignamato, and indeed, Fazi Battaglia’s Massaccio. Most are dry and unwooded, sometimes lees enriched, occasionally subtly oaked. Some emphasise minerality, others refined fruit and floral characters. Those from Matelica (always mineral-infused) to try are Bisci, Collestefano, Del Carmine (Aja Lunga) and La Monacesca. Late-harvested, passito (from Monte Schiavo, Pievalta, Santa Barbara or Vignamato) and sparkling versions (Garofoli) highlight the grape’s versatility. With odd exceptions, Falerio (dei Colli Ascolani) tends to be much more ordinary, its blend usually dominated by the boring Trebbiano. Here as in Abruzzo, the Pecorino grape variety has recently shown its potential, with many producers in the south of the region, now having a white based partly or wholly on it. Good examples are produced by Aurora, Ciù Ciù, De Angelis, Le Caniette, San Giovanni, San Savino and Velenosi – some are sold as Offida Bianco. 20% of other varieties (check out Ciù Ciù or San Giovanni). The odd sounding Lacrima di Morro d’Alba survived near extinction in the 70s but in the past decade several Verdicchio producers have planted Lacrima, a unique local variety produced in the Ancona province around the village of Morro d’Alba. Many are light, highly scented but with firm tannins yet otherwise offer better perfume and texture than most rosés! For better structure and body and an indication of the grape’s true potential look out for those from Conti di Buscareto, Luigi Giusti or San Lorenzo (tiny amounts but stunning). Colli Pesaresi covers several of the diverse but interesting wines of Luigi Mancini. Sangiovese is the leading red variety in Umbria and the regular red from the region’s most important zone, Montefalco is based on it. Montefalco Rosso also includes a small percentage of Sagrantino and in the very best examples offers a characterful alternative to similarly priced Chianti or other Tuscan equivalents. Other Sangiovese-based appellations include Colli Amerini and Colli del Trasimeno, though both are becoming better known for rich, ripe, modern reds based on Cabernet Sauvignon and/or Merlot. These two grapes do exceedingly well in certain parts of Umbria (look for examples from Caprai, Poggio Bertaio, Sportoletti and others). The best wine from Montefalco is Montefalco Sagrantino, from a grape that gives remarkable colour, extract, acid and alcohol. It needs careful vinification but at best produces an intense, concentrated, powerful yet original Italian red and the small plantings are on the increase. Those from Caprai, Còlpetrone, Paolo Bea, Goretti, Madonna Alta, Perticaia, Scacciadiavoli and Tabarrini should be tried. Sweet versions from dried grapes are labelled passito. Colli Martani, a much more extensive zone lying mostly to the west of Montefalco, can provide attractive whites from Grechetto. The other established white DOC is Orvieto (see Lazio). South of Perugia is the small zone of Torgiano (DOCG for Riserva) for Sangiovese based reds that also include Canaiolo and Ciliegiolo. The Lungarotti reds responsible for its status are at last making a sustained revival. The most important appellation in Lazio is now the regional IGT. Whether from the border with Umbria and Tuscany, the coast (Cerveteri) or the Colli Albani (Alban hills) many new wines are appearing. The majority are reds made from Cabernet Sauvignon and/or Merlot, though Sangiovese occasionally forms the main component. However the positive current trend to producing premium reds from 100% Cesanese (a local variety) might yet give Lazio a more distinctive red wine profile. There are three Cesanese DOCs now. The best examples (Cantine Ciolli for instance) combine texture and complexity within a refined structure. The established DOCs of Est! Est!! Est!! !, Orvieto (shared with Umbria) and Frascati are for the most part all based on the Trebbiano grape and offer little in terms of serious quality, but there are some reasonable examples of each and some good, late-harvested sweet styles. For Orvieto go for Castello della Sala, Decugnano dei Barbi, La Carraia or Palazzone. Frascati based on Malvasia tends to be much better – try those from Castel de Paolis, Fontana Candida and Villa Simone. 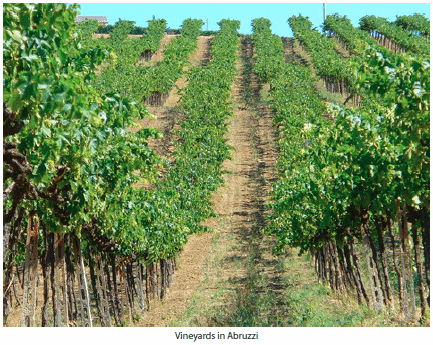 Abruzzo has two region-wide DOCs and the majority of wines are either Montepulciano d’Abruzzo, if red, or Trebbiano d’Abruzzo if white. There are an increasing number of good examples of the red from the characterful, peppery and good value everyday versions to so much more when the fruit is top-notch. There is an increasing number of ambitious examples and more are beginning to combine depth and substance with refinement and complexity achieved for so long by Valentini. If the combination of power, richness and class of Masciarelli’s Villa Gemma is beyond your reach consider the best from Agriverde, Fratelli Barba, Caldora, Castorani, Cataldi Madonna, Farnese, La Valentina, Monti, Nicodemi, Emidio Pepe or Ciccio Zaccagnini or newer names such as Montipagano or Nicola Santoleri. Some of these producers now sell their top wines under the more restricted Montepulciano d’Abruzzo Colline Termane DOCG. The rosato version of Montepulciano, Cerasuolo is variable – both from producer to producer and vintage to vintage. Trebbiano d’Abruzzo can still be pretty dull but while Valentini’s excellent example is usually cited as the one exception be sure to also taste those from Masciarelli (Marina Cvetic), Nicodemi (Notàri), Agriverde (Riseis di Recastro) or Fratelli Barba (Vigna Franca). As in the southern Marche an emerging white grape is Pecorino, occasionally transformed in to an intriguing white with good structure and flavour. (try from Agriverde, Contesa or Franco Pasetti). Decent examples of other varietals and blends, both red and white (including the interesting Passerina), can appear under the Controguerra DOC. In Molise, Biferno was until recently its one important DOC. Like the reds of Abruzzo it is based on Montepulciano but additionally includes some Aglianico. The white is similar to Trebbiano d’Abruzzo. 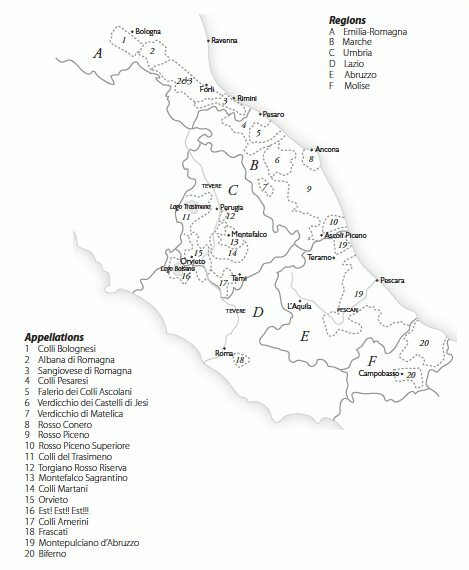 Newly created is a region-wide Molise DOC including essentially varietal examples of Aglianico, Montepulciano, Falanghina, Greco and Moscato. The leading producer is Di Majo Norante.